In a world of constant change, excess information and constant monitoring, maps are increasingly important for displaying information and giving statistics geographical context. For local government, the distribution of funds, investment, services and more besides has always been up for political discussion: who is getting what? People want to know reasoning and evidence behind wealth distribution? Can decision-makers ever make objective choices based on numbers alone? As the volume and quality of available data continue to grow, administrations and companies are in a position to improve the quality of their decisions. 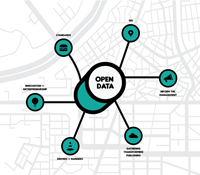 Several of the partners in Opening Up have collaborated to assess the best ways to use open data in internal planning and proposals; they have also explored how data can inform performance indicators at different geographical levels of the locality.